Mesa Verde National Park is a U.S. National Park and UNESCO World Heritage Site located in Montezuma County, Colorado, United States. The park occupies 81.4 square miles (211 square kilometers), and features numerous ruins of homes and villages built by the ancient Pueblo people. Over 4,000 sites and 600 cliff dwellings exist in the park, which is best known for its spectacular cliff dwellings, structures built within caves and under outcroppings in cliffs. Little is known of the people who constructed these dwellings, and their reason for leaving is unclear. Archeological digs have provided clues to their lifestyle transitions throughout the 1300 years they occupied that land, but there exists no written record. 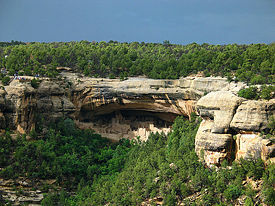 Mesa Verde National Park occupies a high tableland area of 81 square miles (210 square km). A large sandstone plateau, elevations in the park range from about 6,100 feet (1,860 meters) to more than 8,500 feet (2,600 meters) above sea level. 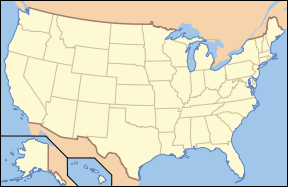 The northernmost point is 13.2 miles (21.2 kilometers) farther north than the southernmost point; the westernmost point is 11.9 miles (19.2 kilometers) farther west than the easternmost point. The terrain in much of the park is dominated by ridges and valleys running roughly north and south; many of these ridges peak at an east–west crest near the park’s northern border, which turns more northerly–southerly towards the park entrance. Deep canyons cut into the plateau leave narrow strips of mesa between the canyons, with niches and alcoves of various sizes in the sandstone of these canyon walls. Summers in Mesa Verde can be very warm reaching the 90s (degrees F), however, the evenings are cool. Thunderstorms in the afternoons of July and August are quite common. Fall weather remains warm during the day and cool at night. Winters are mild, but temperatures often dip below freezing at night and the higher elevations can have snow as early as October and as late as May. Spring can be quite variable with 30 degrees and snow or warm sunny days around 70 degrees F.
With a semi-arid climate and fairly high altitude, mainly Douglas fir and Ponderosa pine are commonly found in the area. Big sagebrush, snowberry, gambrel oak, and pinyon-juniper are all in abundance as well. Flowers commonly seen are the aster, evening primrose, Indian paintbrush, larkspur, lupine, and pricklypear cactus. There are a large number of birds in the park, including hawks, golden eagles, and peregine falcons. In the canyons are the woodpeckers, warblers, chickadees, jays, and many other species. 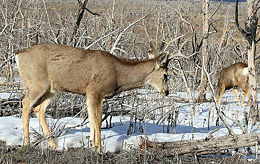 Mule deer and wild turkeys are very common in the park. Elk are the most common large animals. Other mammals include squirrels, chipmunks, rabbits, bats, skunks, porcupines, raccoon, coyotes, gray fox, mountain lions, and black bears. There are several species of snakes and lizards found in the park, including the prairie rattlesnake, bullsnake, collared lizard, sagebrush lizard, northern plateau lizard, and short-horned lizard. About 100 million years ago a great inland sea covered this area. Streams coming in from the west carried mud and sand into the shallow water. It took more than 10 million years to deposit the 2,000 feet that make up the Mancos Formation. As the water became shallower due to sand coming in from the sea, shale became sandier. Because sediments were deposited in an area of strong currents and wave action, very few fossils remain. However, the Cliff House Formation does contain many vertebrate and invertebrate fossils. The ones near the top of the formation have been dated at approximately 87.5 million years old. The history of the Ancestral Puebloans can be divided into six time periods. The first era, prior to coming to Mesa Verde, the Basketmakers were a nomadic people, hunter-gatherers who roamed in small bands, and lived in the caves and valleys. They hunted rabbit, deer, elk, and bighorn sheep with spear-throwing tools called atlatls. All their tools were made of wood, bone, and stone. No metal of any kind was used. They wove yucca fibers into baskets and made clothing from animal skins. In the next 200-year period between C.E. 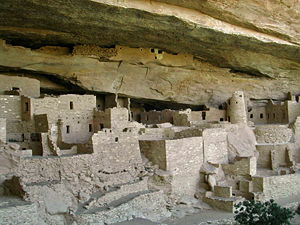 550 and 750, they discovered the rich land of Mesa Verde and built houses in caves and on the mesa tops. Their dwellings, pithouses, were pits or holes dug down a few feet into the ground with four main timbers at each corner to support a flat roof. During this time they learned to make pottery and began to develop their agricultural skills. It is also around this time period that turkeys were domesticated. From C.E. 750 to 1100 they began building their houses above ground using poles and mud, placing them side-by-side in a semi-circular row establishing small villages. By the year 1000 their building skills had advanced and they used sandstone blocks to construct the houses. These were built around the original pithouses, which they used as their kivas. From 1150 to 1300 the population was in the hundreds. Round towers were built and the kivas moved inside the houses instead of out in the open. The level of craftsmanship rose in all areas such as weaving, pottery, and jewelry making, as well as their masonry work, which is considered the finest ever built in Mesa Verde. For reasons unknown, around the year 1200, the people began to move back into the alcoves of the cliffs that had sheltered their ancestors. They lived there for about 100 years, and then by 1300, Mesa Verde was deserted. It is still a mystery as to what happened. It is believed that some of today’s Pueblo Indians, which number around 35,000 living near the Rio Grande and Colorado River in the Arizona and New Mexico region, are the descendants of the Mesa Verde cliff dwellers. They must have traveled south and east in the late twelfth century, and established new communities there. Spanish explorers in the seventeenth century encountered their communities of apartment-like structures, calling them pueblos, meaning village. The Cliff Palace in 1891, photo by Gustaf Nordenskiöld. Spanish explorers seeking a route from Santa Fe, New Mexico to California in the 1760s and 1770s were the first Europeans to reach the Mesa Verde (“green table”) region, which they named after its high, tree-covered plateaus. However, they never got close enough to see the ancient stone villages, which would remain a secret for another century. Occasional trappers and prospectors visited, with one prospector, John Moss, making his observations known in 1873. 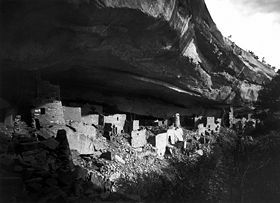 The following year he led eminent photographer William Henry Jackson through Mancos Canyon, at the base of Mesa Verde. There, Jackson both photographed and publicized a typical stone cliff dwelling. In 1875 geologist William H. Holmes retraced Jackson’s route. Reports by both Jackson and Holmes were included in the 1876 report of the Hayden Survey, one of the four federally financed efforts to explore the American West. These and other publications led to proposals to systematically study Southwestern archaeological sites. They did not lead to action for some years. Meanwhile, ranchers were beginning to settle the Mancos Valley. Some climbed up into Mesa Verde and observed more and larger stone structures. Looting of artifacts began, both for home display and for sale to visitors to the region. In a dismal two decades of despoliation, the most responsible ranchers were members of the Wetherill family, who also had the best relations with the local Ute tribe on whose territory Mesa Verde was located. The Wetherills collected artifacts for sale to the Historical Society of Colorado as well as to private collectors, and began assembling a small library of relevant publications. They also saw the tourist potential of the cliff dwellings they now sought out systematically. Over several years they reoriented their ranch toward guiding tourists through the cliff dwellings, and became the first experts on them. Although they continued to dig in the ruins, knocking down some walls and roofs and gathering artifacts without extensive documentation, the Wetherill’s actions were more responsible and considerate than those of the looters that preceded them. Modern archaeological opinion generally agrees that the Wetherill family were reasonable caretakers in an era before archaeological standards and federal oversight and protection. One noteworthy early visitor was a New York newspaper reporter named Virginia McClurg, whose efforts over a period of years eventually helped lead Mesa Verde to park status. Another, in 1889 and 1890, was photographer and travel writer Frederick H. Chapin. He described the landscape and structures in an 1890 article and 1892 book, The Land of the Cliff-Dwellers, whose many excellent photographs offered the first extensive views of Mesa Verde available to the public. Like most other visitors in the early years, he was guided by the Wetherills. I shudder to think what Mesa Verde would be today had there been no Gustaf Nordenskiöld. It is through his book that the cliff dwellings of Mesa Verde became known and his volume might well be called the harbinger of Mesa Verde National Park as we know it today. … Parties of “curio seekers” camped on the ruin for several winters, and it is reported that many hundred specimens therefrom have been carried down the mesa and sold to private individuals. Some of these objects are now in museums, but many are forever lost to science. In order to secure this valuable archaeological material, walls were broken down … often simply to let light into the darker rooms; floors were invariably opened and buried kivas mutilated. To facilitate this work and get rid of the dust, great openings were broken through the five walls that form the front of the ruin. Beams were used for firewood to so great an extent that not a single roof now remains. This work of destruction, added to that resulting from erosion due to rain, left Cliff Palace in a sad condition. As concern grew over the archaeological well–being of Mesa Verde’s ruins, and those in other nearby sites, the area was established as a national park on June 29, 1906. As with all historical areas administered by the National Park Service, the park was listed on the National Register of Historic Places on October 15, 1966. It was designated a World Heritage Site on September 6, 1978. The park was named with the Spanish for “green table” because of its forests of juniper and piñon trees. The Mesa Verde Administrative District was designated a National Historic Landmark on May 29, 1987. It consists of the first buildings constructed by the National Park Service (1921), which are based on cultural traditions represented in the park area. The principal designer believed that structures could be used for interpretive purposes to explain the construction of prehistoric dwellings in the Park, and be compatible with their natural and cultural setting. In the summer of 2002, the park, which is covered with pine and cedar forests, suffered from a large number of forest fires; parts of it were closed. All areas of the park have since re-opened, but some areas show significant damage from the fire. Mesa Verde’s park entrance is about 9 miles (15 kilometers) east of the community of Cortez, Colorado. The visitor center is 15 miles (24 kilometers) from the entrance, and Chapin Mesa (the most popular area) is another 6 miles (10 kilometers) beyond the visitor center. The park’s Chapin Mesa Archeological Museum provides information about the Ancient Puebloan civilization and displays findings and artwork. Three of the cliff dwellings on Chapin Mesa are open to the public. Spruce Tree House is open all year, weather permitting. Balcony House and Cliff Palace are open except in the winter; visitors may tour them only on ranger-guided tours. The cliff dwellings on Wetherill Mesa, including Long House and Step House, can be reached via a mountain road that is 12 miles (19.2 kilometers) long leading southwest from the park visitor center. Many other dwellings are visible from the road but not open to tourists. 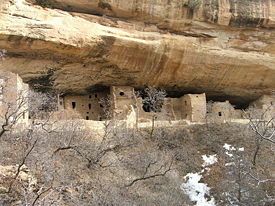 In addition to the cliff dwellings, Mesa Verde boasts a number of mesa-top ruins. Examples open to public access include the Far View Complex, Cedar Tree Tower, and the Sun Temple, all on Chapin Mesa, and Badger House Community, on Wetherill Mesa. Also in the park are hiking and nature trails, a campground, and facilities for food, fuel, and lodging; these are unavailable in the winter. Hikers must register at the Chief Park Ranger’s Office before hiking on two of Chapin Mesa trails; Petroglyph Point Trail, which is 2.8 miles starting at Spruce Tree House trailhead ending near the museum and Spruce Canyon Trail, which is 2.1 miles and winds down, through, and back up Spruce Canyon. There are several beautiful nature walks ranging from .5 to 2.0 miles. Farming Terrace Trail (0.75 mile) leads to prehistoric dams built by the Ancestral Puebloans as terraces used in farming. The Far View Archeological Sites Trail is a level half-mile trail leading to six mesa top sites and is open year-round. In the winter when there is sufficient snowfall, cross-country skiing or snowshoeing can be a very peaceful experience. The Cliff Palace Loop Road provides a relatively level six-mile loop with scenic views. Mesa Verde is best known for a large number of well-preserved “cliff dwellings,” houses built in shallow caves along the canyon walls, which consist of rooms and areas called kivas. A kiva was usually a round room and believed to have been used for religious and other communal purposes. It is a Hopi word for ceremonial room. Kivas are entered through a hole in the roof. A stone bench for sitting lines the inside wall, sometimes interrupted by support columns for the roof. There is usually a hole or indentation in the floor, known as a sipapu. Pueblo belief systems state that the sipapu symbolizes the connection from birth with Mother Earth. It may also represent the spot from which the original inhabitants emerged from the lower world. Near the center of the kiva is a fire pit called a hearth. A ventilation shaft on one side supplies floor-level air for the fire. The ventilation shaft is generally located on the eastern side of the kiva. For most of the twelfth and thirteenth centuries, the Classic Period, the Ancient Puebloan Indians lived in these dwellings. The reason for their sudden departure around 1275 remains unexplained; theories range from crop failures due to a prolonged period of drought, to an intrusion of hostile tribes from the North, to religious or cultural changes. Cliff Palace: This ruin is the best known of the cliff dwellings in Mesa Verde and the largest in North America. Cliff Palace is a large, impressive ruin built into an alcove in a sandstone cliff. The alcove is 89 feet deep and 59 feet high (27 m x 18 m). The structure is 288 feet (88 m) long. The site has 220 identified rooms and 23 kivas. One kiva, in the center of the ruin, is at a point where the entire structure is partitioned by a series of walls with no doorways or other access portals. The walls of this kiva were plastered with one color on one side and a different color on the opposing side. Archaeologists believe that the Cliff Palace contained two communities and that this kiva was used to integrate them. Rooms that had hearths would indicate that the room was used as living space as opposed to storage space. Based on the number of rooms with hearths, it is estimated that Cliff Palace was home to between 100 and 150 Anasazi. Although this and other Mesa Verde sites are large and well constructed, they demonstrate a long history of occupation and their architectural design is an aggregation of dwellings and storage spaces that developed slowly and randomly. Accurate archaeological information from this site has been limited due to several decades of digging and collecting at the turn of the twentieth century. Mug House: This ruin situated on Wetherill Mesa was professionally excavated in the late 1960s by archaeologist Arthur Rohn. The structure contains 94 rooms, on four levels, including a large kiva, with simple vertical walls and masonry pilasters. This ceremonial structure has a keyhole shape, due to a recess behind the fireplace and a deflector that is considered an element of the Mesa Verde style. The rooms clustered around the kiva formed part of the courtyard, indicating the kiva would have been roofed. Sand Canyon Pueblo: A very large open site, Sand Canyon Pueblo contains at least 420 rooms, 90 kivas, and 14 towers. The site was evidently chosen for a spring at the head of a small canyon. Excavations indicate that the pueblo was built to an architectural plan, and was constructed between C.E. 1250 and 1270. Additional residential rooms were added later. Distinct features include a D-shaped multi-walled structure and a great kiva, and characteristics that may be related to Chaco Canyon architecture. 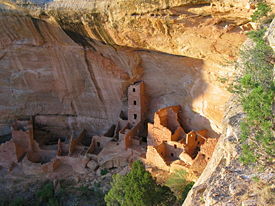 Spruce Tree House: Located on Chapin Mesa, this cliff dwelling is easily accessible and well preserved. The ruins include a kiva with a restored roof that visitors can enter. Excavations indicate that this structure, like many other dwellings in Mesa Verde, was probably occupied for less than a century. Square Tower House: The tower that gives this site its name is the tallest structure in Mesa Verde. This cliff dwelling was occupied between C.E. 1200 and 1300. Mesa Verde Reservoir: These ancient reservoirs, built by the Ancient Puebloans, were named a National Civil Engineering Historic Landmark on September 26, 2004. Reynolds, Judith, and David Reynolds. Nordenskiold of Mesa Verde. Xlibris Corporation, 2006. ISBN 1425704840. Uhler, John William. Mesa Verde National Park, US National Parks. Retrieved June 19, 2007. Wiki Travel. Mesa Verde National Park, Retrieved June 19, 2007. All links retrieved September 18, 2018. Mesa Verde National Park. National Park Service. Mesa Verde National Park. U.S. National Parks. Mesa Verde National Park. Terra Galleria. History of "Mesa Verde National Park"
This page was last modified on 18 September 2018, at 16:30.